When you use data blending to combine your data from different data sources, there are a few common issues that might arise. This topic lists them and describes how you can respond to each situation. Data blending has some limitations regarding non-additive aggregates such as COUNTD, MEDIAN, and RAWSQLAGG. Non-additive aggregates are aggregate functions that produce results that cannot be aggregated along a dimension. Instead, the values have to be calculated individually. All Number functions, except for MAX and MIN, are non-additive aggregates. For more information, see Tableau Functions (by Category). Non-additive aggregates from the secondary data source: Non-additive aggregates are only supported in the secondary data source if the linking field from the primary data source is included in the view and no non-aggregated dimensions from the secondary data source is included in the view. Some number functions can still be used if they include an additive aggregation. For example, use ROUND(SUM([Sales]),1) instead of ROUND([Sales],1). LOD expressions from the secondary data source: This error can also appear when you use a level of detail expression in a view that uses data blending. To resolve the error, make sure the linking field in the primary data source is in the view before you use an LOD expression from the secondary data source and remove any dimensions, including dimension filters, from the secondary data source. When you blend data, make sure that there is only one matching value in the secondary data source for each mark in the primary data source. If there are multiple matching values, you see an asterisk in the view that results after you blend data. For example, suppose you have two data sources: Population and Superstore. The primary data source, Population, has a field called State. The secondary data source, Superstore, contains fields called State and Segment. In the secondary data source, each state has multiple segments. Alabama, for example, has three segments: Consumer, Corporate, and Home Office. 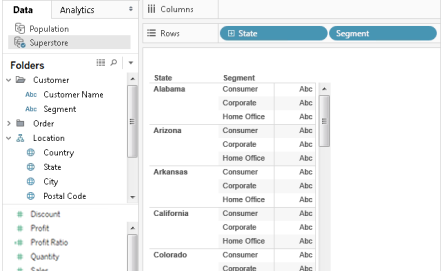 When you blend the two data sources on the State field, you create a relationship where individual state values (in the primary data source) can have multiple segment values (in the secondary data source). In this case, multiple values for segments in the secondary data source for each corresponding state value in the primary data source cause asterisks to appear in the view, as demonstrated by the images below. Avoid asterisks in the sheet by making sure that there is only one matching value in the secondary data source for each mark in the primary data source. Though the way you ensure this depends on the data and the view you're trying to create, consider one of the following suggestions to resolve asterisks in the sheet. Add field with a higher level of granularity from the primary data source to the sheet. For example, suppose you have a view similar to the example used above. Consider adding a field such as City into the sheet because its values are at a higher level of granularity than a field like State. Rebuild the view to switch the primary and secondary data sources with each other. In general, you should make the data source whose values have a higher level of granularity the primary data source. For example, suppose you have a view similar to the example used above. Consider making Superstore the primary data source and Population the secondary data source. Data blending works by supplementing the data in the primary data source with data from the secondary data source based on the linking field. This means Tableau takes all the data in the primary data source, and only the corresponding matches in the secondary data source. 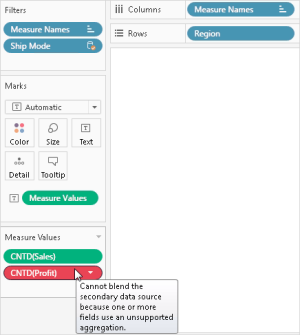 If Tableau cannot identify at least one matching value in the secondary data source for the corresponding value in the primary data source, null values appear. When you make a field-level customization that blends two data sources, the customization is based on one of the data sources, the primary data source. 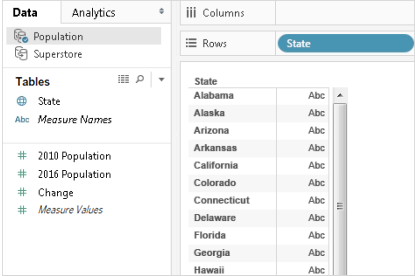 Then, when the primary and secondary data sources are published to Tableau Server or Tableau Online, the primary data source, which contains the customization (i.e., the reference to the secondary data source) no longer works. The customization no longer works because the relationship between the primary and secondary data sources is lost. This is because the relationship between the primary and secondary data sources is defined at the workbook level. For example, suppose you have two data sources: Store - Main and Store - West. You create a field-level customization, like a calculation, that combines the sales totals from the primary data source, Store - Main, with the sales totals from the secondary data source, Store - West. As soon as you publish the data sources to Tableau Server or Tableau Online, the calculation in Store - Main no longer works. This is because the calculation refers to the secondary data source, Store - West, whose location is now undetermined. Before creating any field-level customizations, publish each data source first. Connect to each data source. Create a workbook that contains the field-level customizations that you need. You can use this workbook as a "template" that can be shared and downloaded by you and others. Underlying data shows different values than blended data. See Underlying Data from Secondary Data Source Not Displayed or Consistent with Blended Data.